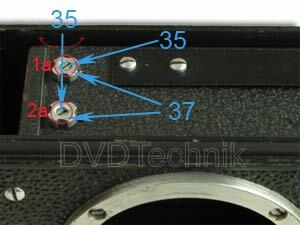 Before starting to horizontal and vertical adjustment RF you should know that cameras Zorki, FED have a working piece 28,80mm +/-0,02мм. As the film in a personnel window is curved inside of the camera, the working distance of the camera is established on 0,03-0,005 mm more, than working distance of an objective (28,84 mm). 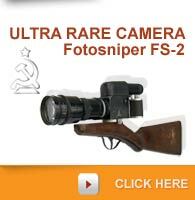 During the installation of a working distance it is not necessary to assort the camera. The working distance of the camera is adjusted by correct installation of a flange (20) Pic.7. It is necessary to adjust paper linings (21) Pic.7 between the camera and a flange (20) to receive working distance . To measure working distance it is necessary to have the special device which you do not have. That is why I'll not begin to explain how it is necessary to do. Before starting adjustment of horizontal and vertical adjustment RF it is necessary to have pliers, a hour tweezers (certainly it is better to have for this purpose a special key, but if you want you can make the key for vertical adjustment by yourself), 2 screw-drivers with width of an edge 1,2 and 2,5 mm. As the beginning I offer you to make the vertical adjustment. VERTICAL Vertical adjustment of RF is made by a wedge (2) look Pic.1 and Pic.2. It is necessary for you to make the following steps: 1) unscrew chrome plated rim (1) look Pic.1 and Pic.4 which is screwed on the holder (3) very important remark: after having removed chromic rim (1) screw up against the stop a holder (3). 2) Having inserted the ends of a tweezers or a key in the apertures of a frame, a wedge (2) is turned, while both images will not coincide on a vertical one with another. For this purpose it is possible to use drawn on a sheet of a white paper a cross located on distance of 1-2 m from the camera, or a roof of a building on the opposite side of street. 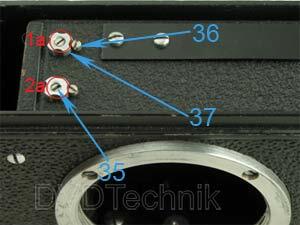 HORIZONTAL Horizontal adjustment of RF is made by the screw (4) look Pic.1, Pic.2 and Pic.15. It is necessary for you to make the following steps: 1) establish a lens in position ∞. 2) unscrew with a wide screw-driver the lateral screw (38) Pic.3 and insert a thin screw-driver into a jack for the screw. Easily rotating it, you are to hit in spline of the figured screw (4). Usually screw is being rotated in this or that side depending on position of the second mobile image. If the image does not reach the indefinitely, the screw is screwed up, if passes - unscrewed. It is made until images (motionless and mobile) of the infinite far subject are combined. 3) Check of RF on distance of 2-4 m. For this purpose it is necessary to take a roulette and to measure from a back side of the camera 1, 2 and 4 m and to draw a cross on a sheet of a white paper. After that direct on RF on this sign and check the indications of a scale of distances on a lens. If they are not truthful, RF is not adjusted. In this case it is necessary to unscrew a lens and to continue adjustment of RF, turning a cam (14) Pic.2 no more than on 3-5 °. If value on a scale of distances is more than exact, it is necessary to turn a cam upwards. If it is less - downwards. Pic.2 Having turned a cam in the necessary direction on 3-5 °, adjust RF again, directing on infinity of the removed subject and on 1 m. It is made until indications of RF on infinity and on 1, 2, 4 m will not accurately coincide with a scale of distances of a lens. Deviations on a scale in 0,5-1mm are supposed at distance up to object of 1, 2 and 4 m, at infinity there should be an absolute coincidence. The partial disassembly of the camera. The partial disassembly of the camera. 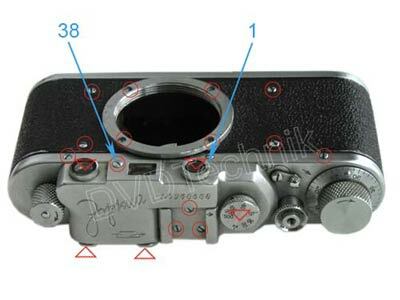 Partial disassembly of the camera is made in medial, and sometimes and fine repair of the mechanism of the gate, RF and at adjustment of the lenses. It is desirable to remember arrangements of all details at partial disassembly Pic.3. A flange with screws Pic.7 is put in the turned upside down position, because under him paper adjustment linings are situated, and you shouldn't change their position not to break adjustment. Screws of a lens of a flange pass in body and they are screwed up in apertures of linings of top figured (18) and lower (19) Pic.7. After that unscrew facing screws, and other details which are shown on Pic.3. Extraction RF from the body. To take RF from the body it is necessary for you to unscrew screws (7, 8, 9, 15) Pic.6. RF may have a little difference from each other in different models Zorki and FED. Sometimes earlier RF consist of two parts as in our case (29) and (30) on Pic.10. Cleaning and lubrication of details and nodes of the mechanism.Cleaning and lubrication of details and nodes of the mechanism. 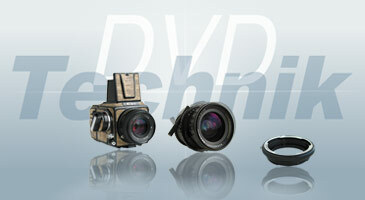 Through the certain time intervals the camera demands survey, cleaning and lubrication. Rubbed surfaces of the mechanism are subjects to lubrication: cartridges and axes of all cones (27); a spring of a brake; axes of sleeves (25), (26) and a reel of shutters; the cartridge where the clutch with a finger rotates; the cartridge of a driving element of return of a film; an axis of a reel of the reception coil. Mechanisms are greased with watch oil. For cleaning it is necessary for you to have a rigid brush, gasoline and if it is possible vacuum cleaner with a small nozzle. It is necessary for you to clean the old thickened greasing and the rests of film. 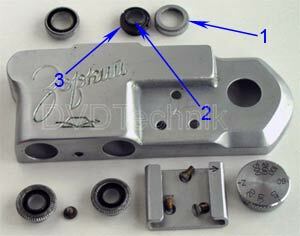 The special attention should be paid to lubrication of axes of sleeves (11), (12) and a reel (10) Pic.5,6. On Pic.8 after removal of RF you can see axes of these sleeves (25), (26) reel. There is no necessity to remove RF for lubrication of axes, it can be made with the help of a syringe Pic.5. For adjustment of density of landing of the coil on a reel special springs (28) Pic.9 are made. It is necessary to raise a little springs with the help of an edge of a knife to sit a spool more densely. If spool sits too densely and it is difficult to take it from the camera by the hand, springs should be pressed inside. Malfunctions of a brake latch and failure of shutter speeds "B". Malfunctions of a brake latch (23) Pic.8,11,12,13 and failure of shutter speeds "B" have close interrelation. The endurance "B" (manual) may have any size and is equal to time of pushing the trigger button (39). At all automatic shutter speeds the brake latch (23) releases the second curtains with the help of the lever of an exposition (38). At shutter speeds "B" the lever of an exposition does not any influence on a brake latch (23). The brake latch (23) goes upwards and downwards because of action of 2 springs top (24) Pic.11,12 and low (34) Pic.13 While pressing the trigger button (39) lower spring (34) moves down and detains the second curtains. Shutter is open, the personnel window is completely covered. Having lowered the trigger button (39), the lower spring is released (34) which squeezes out a brake latch (23) and releases the second curtains. In other words at speeds "B" braking knuckle (33) Pic.11,12 should get in dredging of a latch and delay here, otherwise it is necessary to take out a brake latch and to cut a core a little. There is one more reason of failure "B". The finger of the lever (38) of exposition operates on a brake latch (23) at all speeds, except for "B". This problem appears in inexact glueing of the shutters. It is very difficult to re-stick shutters and not every amateur photographer is able to do this, it is possible (38) Pic.12 to make the finger of the lever of an exposition little bit more thin from lateral aspect. For this purpose it is necessary to take off the lever of an exposition (38) and to cut a finger Pic.12 a little with a needle file. The most typical breakages of the shutters. 1. The slowed down movement of the curtains is defined by the dark overdone negatives. If you will unscrew a lens you will find out the slowed down movement of the curtains. This problem appears because the mechanism has become soiled or because old oil has dried up and condensed. In the most cases such problems are observed in those cameras which were not used for many years. 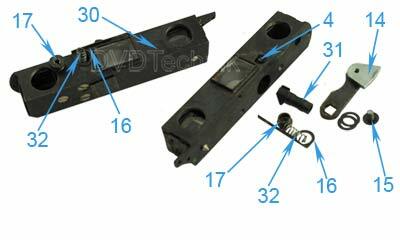 In this case the mechanism demands cleaning and lubrication. 2. The second shutter of the curtains at some endurances does not come back in a starting position. It is caused by the same reason, as the slowed down movement of the shutters. Except cleaning and lubrication of the mechanism, it is necessary to pull on 0,5-1 revolution springs of the curtains 1а and 2а. 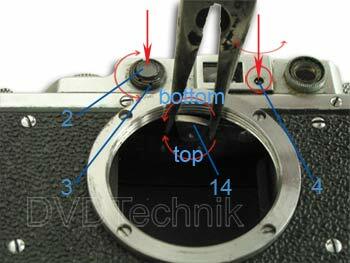 For adjustment of the first 1а and the second 2а shutter it is necessary to unscrew 2 screws 36 (Pic. 15) and to start a tension or easing.Often sellers make an inadmissible tension of springs of sleeves to keep the camera working, that causes misoperation and very hard platoon of the gate. Not so many skilled sellers are able to remove fine malfunctions in the best quality. That is why very frequently after lubrication with the watch oil on the necessary points, the camera works absolutely in other way. In this case it is necessary for you to weaken springs of sleeves and to adjust your gate by yourself. 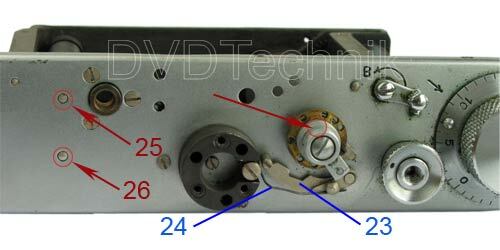 Before loading of the film it is very important to check up landing of your coil (42) on a reel look Pic.8. It is necessary to adjust correct landing of the reception coil which is responsible for normal work of the camera. I offer you two ways of loading of a film. The first way. It is necessary for you to make the following steps: 1) Make a cut (I do without this procedure) on film and insert its end into the reception coil (42) as shown in Pic.17. 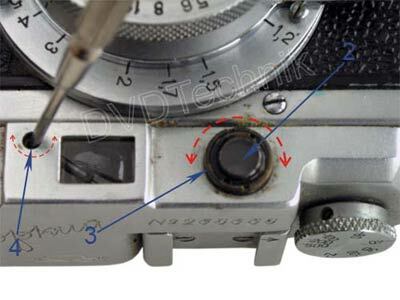 2) On the camera put shutter speeds in position "B" and make release of the shutter and push the button of release (39) until the lever (40) will not be switched in a mode of rewind. As a result of these actions the shutter becomes completely open and you can easily supervise loading of film in the camera. 3) Take the coil in the left hand and charged magazine in the right, and enter film into a cuts as shown in Pic.18, while lowering them in jacks in regular intervals. If magazine does not reach a place, turn the handle of return rewind. That film should be laid on cone, if necessary you can easily correct it by a hand. 4) Put on the lower cover. 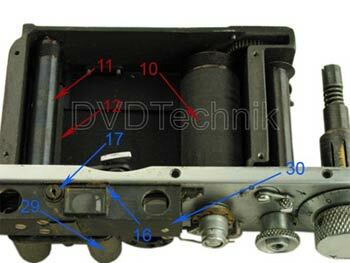 5) Return the lever of rewind in the former position, the second curtains should close. If curtains don't move it's enough an easy contact of the work head and it will there and then be closed. 6) Start the mechanism two times, pressing the trigger button (39) after each starting, look whether the mechanism pulls a film smoothly and whether the head of return rewind rotates. 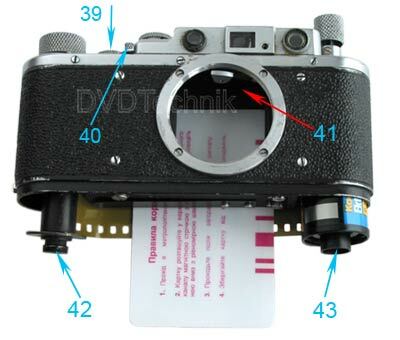 If the head does not rotate, it is necessary to check up correctness of the loading a film in a camera. 7) Install "0" on scales of the counter near the index. The second way. 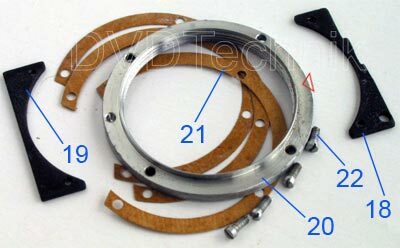 It is necessary for you to make the following steps: 1) Make a scrap on film and insert its end into the reception coil (42) as shown in Pic.17 . 2) Insert a plastic card no more than 0,4 mm width into a crack of the camera. 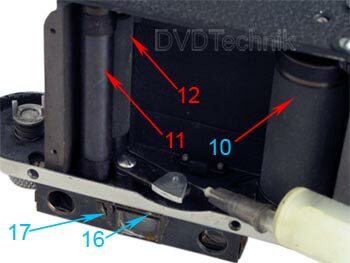 3) Take the coil in the left hand and charged magazine in the right hand, and as shown in Pic.19 enter film into a cut before a plastic card (film will not fall up on the board (41)), in regular intervals lowering them in jacks. If magazine does not reach a place turn the handle of return rewind. After that remove a card and watch film to be laid on cones. 4) Put on lower cover. 5) Start the mechanism two times, pressing the trigger button, correct the film if necessary.Look whether the mechanism pulls a film smoothly and whether the head of return rewind rotates.If the head does not rotate, it is necessary to check up correctness of the loading a film in a camera 6) Install "0" on scales of the counter near the index. While pressing the trigger button smoothly shutter speeds "B" slips. 1. 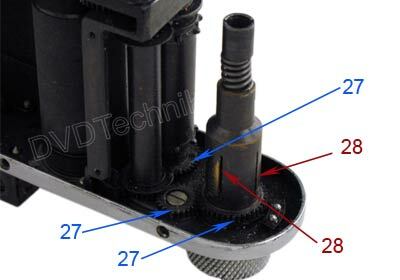 The brake latch 23 is lifted too highly if to compare with a brake cam 33. 3. The spring 24 of a brake latch 23 has come off. 1а. take a brake latch 23 and truncate a core. 2а. take a brake latch 23, grind its core and grease with watch oil. 3а. Before establishing the come off spring 24 back, it is necessary to correct its form, having prevented repeated coming off. Shutter speed ''B" works as 1/20 s. Long operation or wrong assembly of the shutter. The result is the increasing of course of the lever speeds 38, and the lever in the end of a course touches a brake latch 23 and allocates it. At an insignificant contact it is enough to file a finger 38. in a place of a contact with a brake latch 23. 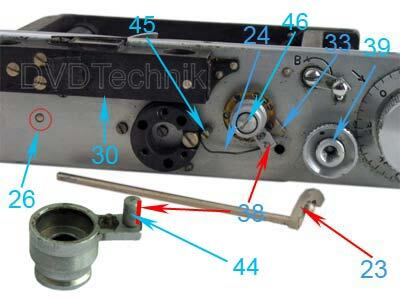 If the lever contacts a brake latch 23 strongly, it is necessary to disassemble shutter for elimination of malfunction. Shutter speed ''B". Shutter is left opened, but on other speeds it works normally. 1. 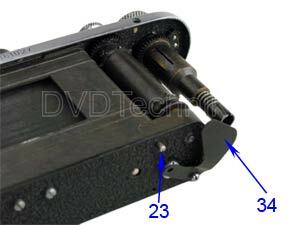 The brake latch 23 too is low located if to compare with a brake cam 33. 2. The brake latch 23 shakes on a core. 3. The flat spring 34 has become weak or unscrewed on the part of the low cover. 1а. unbend a brake latch 23 to top. 2а. strengthen a brake latch 23, having unriveted a core in a junction with a latch. 3а. hold on screws that fix the flat spring 34, and if it will not help, take off and strengthen a flat spring 34. Speeds can not be installed. The screw 46 that fixes speeds has been unscrewed. To screw 46 up till the stop the screw. Shutter is not started up to the end , the head of speeds is not established in all positions. The brake latch 23 has skipped through an stop 45. To return a brake latch 23 back on a place. Shutter works on all speeds as on speed ''B". The finger 44 of the lever of speeds 38 has dropped out. To find a dropped out finger 44 and rivet it to the lever of speeds 38. Shutter doesn't work on speeds 1/20, 1/30, 1/40, 1/60 s, and on short speeds works. The greasing has become soiled, thickened and dried up. Make cleaning and greasing of rubed details of the shutter. Curtains of the shutter are left in the started mode. Shutter is not going down. The most probable reason of malfunction is hits of the bits of the film in cones of the shutter. Take off the body of the camera and remove from the shutter bits of the film in all accessible places. The film flares by the exstraneous light. The flare is limited by the size of frame of the camera. 1. The tape of the shutter has got stuck and between curtains the crack was formed. 2. One of tapes has broken or stretched, and between curtains the crack was formed. 3. Curtains have anguishes or cracks and miss light. 1а. To untangle tapes it is necessary to take off the case of the camera and lower protecting from light shield. 2а. To glue torn off tape or to re-stick stretched one. 3а. Small apertures in curtains can be stuck or painted over by black varnish. If curtains were wore out, it is necessary to replace them. Non-uniform exhibiting of the staff at endurances 1/250-1/500 s. As a result of a non-uniform tension of curtains during operation of shutter (long 2a Pic.16) curtains has time to catch up the first (short 1a Pic.16). Reduce a tension of the second curtains or to strengthen a tension of the first.